3-Edith May Walker was born on 26 Apr 1884 in Westbury, Tasmania and died on 7 Aug 1963 at age 79. Edith married John Robert Smith who was a butcher, later working as a wharf labourer. They lived most of their married life in South Melbourne. Edith and Jack had eight children, three daughters and five sons. Edith was very capable, a very good seamstress. She made all the family's clothes. They were a very happy family. 4-Elsie May Smith was born on 23 Aug 1907 in East Devonport, Tasmania and died on 20 Oct 1984 at age 77. 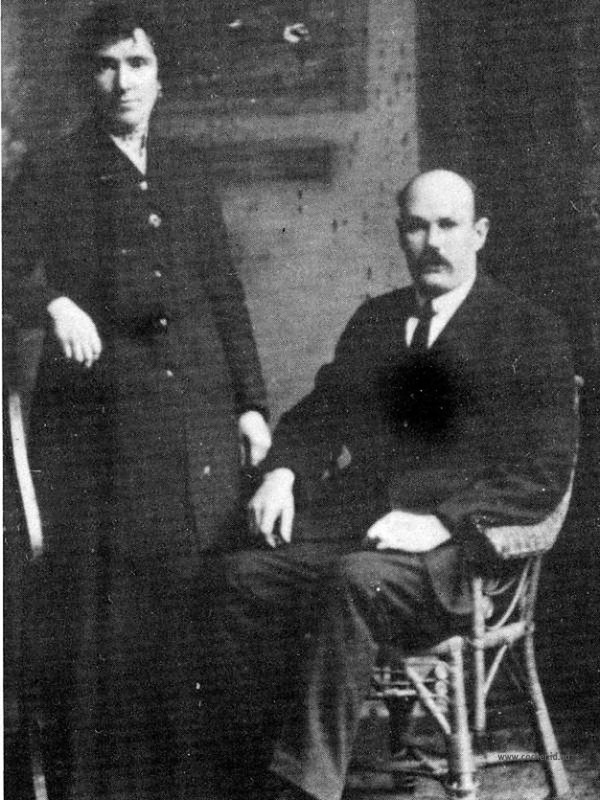 Elsie married William Devlin. William died on 21 Mar 1981. They had two children: Walter Frederick and Stanley William. 5-Walter Frederick Devlin was born on 7 Nov 1928 and died in 1975 at age 47. Walter married Anne Maree Wakeling. Anne was born on 13 Apr 1934 and died on 22 Aug 1981 at age 47. They had two children: Lois Anne and Sandra Mae. 6-Lois Anne Devlin was born on 27 Oct 1950. Lois married Raymond Bennett. They had two children: Ashley and Tracey. 6-Sandra Mae Devlin was born on 19 Aug 1954. Sandra married Allan Kivon. They had one son: Phillip. 5-Stanley William Devlin was born on 19 Oct 1932. Stanley married Faye Jeanette Layton. Faye was born on 28 Aug 1935. They had two children: Karl Anthony and Joanne Le. 6-Karl Anthony Devlin was born on 9 Oct 1960. 6-Joanne Le Devlin was born on 10 Dec 1964. 4-John Robert Smith was born on 3 May 1912 in East Devonport, Tasmania and died on 1 Sep 1985 at age 73. John married Olive Elizabeth Lambert. Olive was born on 19 Mar 1928. They had two children: Brian Robert and Steven John. 5-Brian Robert Smith was born on 19 Feb 1956. 5-Steven John Smith was born on 18 Jan 1961. 4-Edith Grace Smith was born on 29 Nov 1917 and died on 20 Oct 1984 at age 66. Edith married Francis Charles Greenshields, son of Thomas Joseph Greenshields and Clara Mickie. Francis was born on 2 Jan 1911 in Ballarat, Victoria and died on 13 Oct 1975 in Heidelberg, Repatriation Hospital, Victoria at age 64. They had five children: Francis Robert, Jean Lorraine, Mavis Theresa, Wilma Grace and Barry John. 5-Francis Robert Greenshields was born on 4 Jun 1934. Francis married Margaret June Padey. Margaret was born on 8 Oct 1934. They had four children: Debra June, David William, Penelope Margaret and Jacqueline Claire. 6-Debra June Greenshields was born on 23 Jun 1960. 6-David William Greenshields was born on 8 Feb 1965. 6-Penelope Margaret Greenshields was born on 31 May 1967. 6-Jacqueline Claire Greenshields was born on 8 Jul 1968. 5-Jean Lorraine Greenshields was born on 14 May 1937. Jean married Kenneth Edward Mitchell. Kenneth was born on 12 Dec 1934. They had six children: Barry John, Susan Robyn, Francis William, Kenneth Eric, Warren James and Gavin Wayne. 6-Barry John Mitchell was born on 23 Feb 1954. Barry married Barbara Lynn Jennings. Barbara was born on 15 Aug 1956. They had two children: Kelly Ann and Glenn William. 7-Kelly Ann Mitchell was born on 26 May 1976. 7-Glenn William Mitchell was born on 15 Sep 1981. 6-Susan Robyn Mitchell was born on 6 Apr 1956. Susan married Kenneth John Walter Dawson. Kenneth was born on 18 Jun 1954. They had one daughter: Nicole Lorraine. 7-Nicole Lorraine Dawson was born on 26 Oct 1977. Susan next married Noel Frank Michael. Noel was born on 26 Nov 1938. 6-Francis William Mitchell was born on 10 Nov 1957. Francis married Jillian Gaye Nickett. Jillian was born on 30 Jan 1961. They had one son: Aaron William. 7-Aaron William Mitchell was born on 25 Feb 1987. 6-Kenneth Eric Mitchell was born on 25 Jun 1959. 6-Warren James Mitchell was born on 5 Oct 1960. Warren married Michelle Julie O'Keefe. Michelle was born on 15 May 1961. They had two children: Bradley James and Natalie Louise. 7-Bradley James Mitchell was born on 28 Aug 1985 and died on 8 Sep 1985. 7-Natalie Louise Mitchell was born on 16 Oct 1986. 6-Gavin Wayne Mitchell was born on 4 Dec 1962. Gavin married Leanne Margaret Crockett. Leanne was born on 26 Jul 1963. They had one daughter: Tenielle Leanne. 7-Tenielle Leanne Mitchell was born on 10 Jun 1986. 5-Mavis Theresa Greenshields was born on 23 Nov 1940. Mavis married Owen Raymond Mitchell. Owen was born on 25 Feb 1937. They had four children: Kim Lorraine, Vicki Lee, Tina Marie and Shane Owen. 6-Kim Lorraine Mitchell was born on 1 Apr 1959. Kim married Terry Robert Mitchell. Terry was born on 7 Jun 1957. They had four children: Darren Robert, Melissa Jane, Racheal Jane and Tanya Lee. 7-Darren Robert Mitchell was born on 21 Oct 1976. 7-Melissa Jane Mitchell was born on 9 Oct 1980. 7-Racheal Jane Mitchell was born on 20 Sep 1982. 7-Tanya Lee Mitchell was born on 20 Feb 1985. 6-Vicki Lee Mitchell was born on 6 Aug 1960. Vicki married John Stephen Maher. John was born on 28 Nov 1943. 6-Tina Marie Mitchell was born on 6 Oct 1962. Tina married Arthur Maher. Arthur was born on 30 Nov 1961. They had three children: Arron Raymond, Marie Ann and Penny Lee. 7-Arron Raymond Maher was born on 6 Sep 1979. 7-Marie Ann Maher was born on 7 Jan 1982. 7-Penny Lee Maher was born on 1 Dec 1984. 6-Shane Owen Mitchell was born on 17 Apr 1968. 5-Wilma Grace Greenshields was born on 23 Mar 1943. Wilma married John Bulman. John was born on 26 Dec 1942. They had two children: Julie Ann and John Arthur. 6-Julie Ann Bulman was born on 2 May 1964. 6-John Arthur Bulman was born on 9 Sep 1968. 5-Barry John Greenshields was born on 11 Jun 1945 and died on 27 Oct 1947 at age 2. 4-Tasman William Smith was born on 7 Dec 1917 and died on 2 May 1980 at age 62. Tasman married Elverna Doris. Elverna was born on 6 Sep 1919 and died on 1 Feb 1965 at age 45. They had three children: Robert Clyde, Maureen Margaret and Noelene Gladys. 5-Robert Clyde Smith was born on 12 Sep 1939. Robert married Margaret Leslie Eredale. Margaret was born on 26 Aug 1942. They had two children: Darren and Rodney. 6-Darren Smith was born on 10 Oct 1967. 6-Rodney Smith was born on 3 Jul 1977. 5-Maureen Margaret Smith was born on 22 Nov 1944. Maureen married Alan James Granger. Alan was born on 13 Feb 1944. They had three children: Karen Leanne, Paul Alan and Bradley James. 6-Karen Leanne Granger was born on 17 Feb 1971. 6-Paul Alan Granger was born on 16 Jan 1975. 6-Bradley James Granger was born on 11 Jul 1976. 5-Noelene Gladys Smith was born on 21 Feb 1949. Noelene married Robert Robertson. Robert was born on 27 Feb 1944. They had three children: Adam Robert, Sharyn Louise and Danielle Susan. 6-Adam Robert Robertson was born on 15 May 1970. 6-Sharyn Louise Robertson was born on 28 Mar 1972. 6-Danielle Susan Robertson was born on 26 Mar 1977. Tasman next married Mavis Gwendoline Fisher. Mavis was born on 26 Jan 1930. They had one daughter: Vicki Lorraine. 5-Vicki Lorraine Smith was born on 4 Nov 1964. 4-Eric Roy Smith was born on 2 Feb 1920 and died on 11 Oct 1976 at age 56. He served in the Second World War. 4-Edna Mavis Smith was born on 17 Jul 1922. Edna married Kenneth Richard Jennings. Kenneth was born on 19 Nov 1919. They had four children: Marlene Joyce, Edward John, Lorraine Jean and Pauline Jennifer. 5-Marlene Joyce Jennings was born on 5 Jun 1941. Marlene married David John Crossfield. David was born on 20 Feb 1940. They had four children: Debra May, Patricia Joy, Peter David and David John. 6-Debra May Crossfield was born on 10 May 1961. Debra married Hamilton. They had two children: Timothy Carey and Luke. 7-Timothy Carey Hamilton was born on 17 Oct 1983. 7-Luke Hamilton was born on 27 May 1986. 6-Patricia Joy Crossfield was born on 21 Jul 1963. 6-Peter David Crossfield was born on 19 Aug 1966. 6-David John Crossfield was born on 8 Jan 1969. 5-Edward John Jennings was born on 31 Dec 1943. Edward married Pauline Marie Micallef. Pauline was born on 2 Apr 1947. They had three children: Mark Richard, Leanne Marie and Shaun Charles. 6-Mark Richard Jennings was born on 3 Jun 1968. 6-Leanne Marie Jennings was born on 9 Apr 1972. 6-Shaun Charles Jennings was born on 30 Apr 1974. 5-Lorraine Jean Jennings was born on 14 Mar 1945. Lorraine married Kevin John Cook. Kevin was born on 18 Dec 1940. They had four children: Kevin John, Kenneth James, Shane Alan and Paul Robert. 6-Kevin John Cook was born on 14 Aug 1965. 6-Kenneth James Cook was born on 6 Feb 1968. 6-Shane Alan Cook was born on 10 Oct 1970. 6-Paul Robert Cook was born on 25 Jan 1972. 5-Pauline Jennifer Jennings was born on 30 May 1948. Pauline married John William Noonan. John was born on 8 Sep 1948. They had one son: Damien Richard. 6-Damien Richard Noonan was born on 11 Jul 1974. Pauline next married Trevor Gordon Foggie. Trevor was born on 13 Feb 1945 and died on 23 Feb 1985 at age 40. They had one daughter: Kylie Marie. 6-Kylie Marie Foggie was born on 15 Apr 1981. 4-Keith Raymond Smith was born on 11 Oct 1926. He served in the Second World War. Keith married Dorothy Gloria Woodward. Dorothy was born on 3 Jul 1926. They had three children: Susanne Gai, Raymond Keith and Margaret Dorothy. 5-Susanne Gai Smith was born on 25 Sep. Susanne married Paul Adams. Paul was born on 7 Apr 1950. They had three children: Jennifer Gai, Belinda Louise and James Patrick. 6-Jennifer Gai Adams was born on 11 Dec 1973. 6-Belinda Louise Adams was born on 28 Aug 1976. 6-James Patrick Adams was born on 17 Jan 1980. 5-Raymond Keith Smith was born on 3 Jul 1946. Raymond married Judy Skelis. Judy was born on 11 Sep 1950. They had three children: Michelle Toni, Kylie Alicia and Rebecca Nancy. 6-Michelle Toni Smith was born on 17 Apr 1975. 6-Kylie Alicia Smith was born on 13 Apr 1977. 6-Rebecca Nancy Smith was born on 4 Aug 1980. 5-Margaret Dorothy Smith was born on 7 Jan 1950. Margaret married Tony Lucisano. Tony was born on 26 Aug 1951. They had two children: Joanne Margaret and Kerri Ann. 6-Joanne Margaret Lucisano was born on 27 Jul 1980. 6-Kerri Ann Lucisano was born on 19 Jul 1983.